Dr. Manousakis received his Ph. D. in Theoretical Physics, in July 1985, from the University of Illinois at Urbana-Champaign (First Ross J. Martin Award for his thesis). After a Post-Doctoral Research position at the Center for Theoretical Physics at the Massachusetts Institute of Technology (1985-1987) and at the Supercomputer Computational Research Institute (1987-88), he joined the Martech faculty in the Physics Department of FSU. Presently, he is the Donald Robson Professor of Physics and holds the title of Distinguished Research Professor. 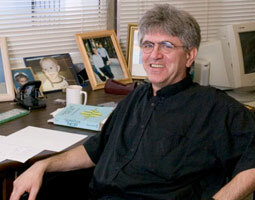 In 2002, he was named Fellow of The American Physical Society (2002). He also received the PAI Award for Excellence in Teaching and Research (1998) and the Developing Scholar Award (1990) from Florida State University. Dr Manousakis' group develops and applies computational and theoretical methods to study novel collective behavior in certain quantum many-body systems which arises because of strong correlations among the fundamental microscopic degrees of freedom. Examples of such systems are: (a) Superconductors and Strongly Correlated Electrons, (b) Superfluids, (c) Electrons in Solids and The Two-Dimensional Electron Gas, (d) Quantum Phase Transitions in Atomically-Thin Films and (e) Phase Transitions in Restricted Geometries and Finite Size Scaling.